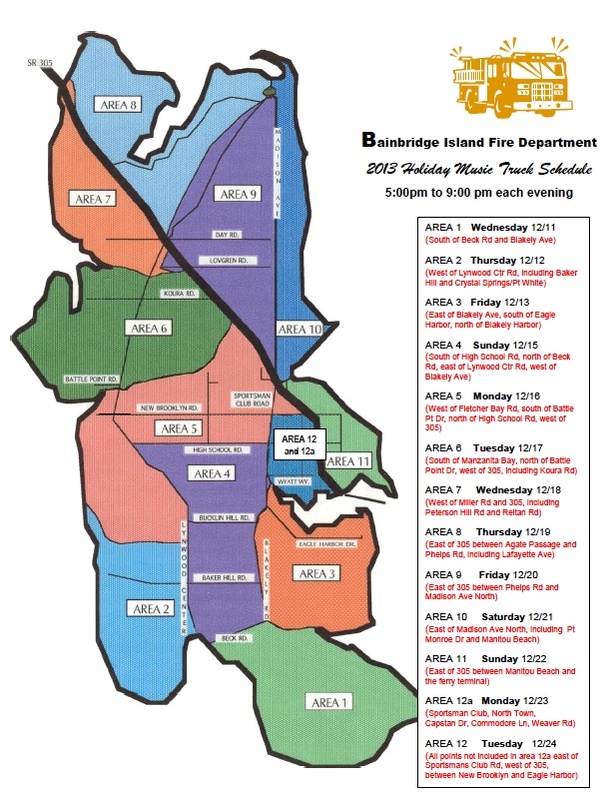 The Bainbridge Island Musical Fire Truck is getting into gear once again – this year it starts on December 11th and spreads musical joy around the island until Christmas Eve. Find your neighborhood on the map below. Click Map for a larger version. And an easier to read schedule is printed down below too. The lighted, musical truck, driven by the Bainbridge Fire Department is out in the evenings from 5-9pm. Every year we enjoy gathering with our neighbors in our cul-de-sac, watching, waiting, (shivering) and listening for the firetruck. The kids are always excited. This tradition, which started back in the 1950′s, goes on my list of things considered “So Bainbridge.” In our cul-de-sac, we are all hoping for a white Christmas season this year. All roads are not listed. Look and listen for the musical truck in your neighborhood between the hours of 5:00 to 9:00 pm.